WARNING: The video above contains graphic images and language. Viewer discretion is advised. Several bouncers from Jay-Z's 40/40 Club in Atlantic City, N.J. have gotten the boot for their part in a melee with club patrons. 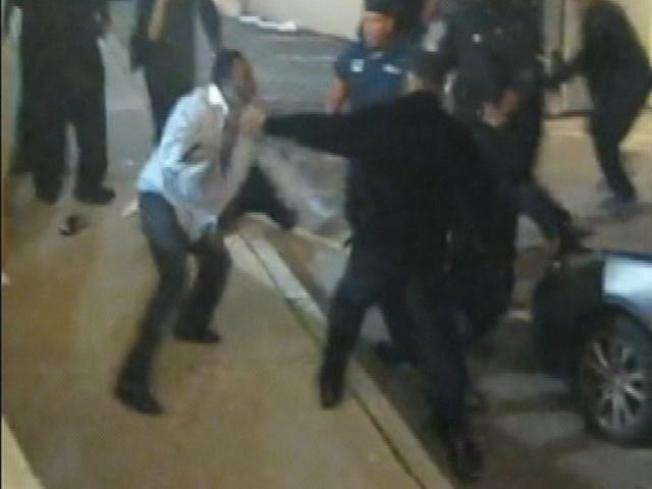 The brawl, which was caught on tape by witnesses, happened outside the popular Atlantic Avenue hot spot in the early morning hours of Nov. 28. In the video, two club goers are repeatedly pummeled by as many as 13 staffers in a rear parking lot. The victims were then arrested for disorderly conduct. The men -- Tyrell Durant, 26, and Leonard Clark, 25 -- said they were beaten without cause. The 40/40 Club offered little comment on the attack, claiming the incident was provoked after Durant struck a bouncer. Despite their justification, several bouncers involved were given the pink slip Thursday, says a former member of the security staff. The bouncer -- who asked to remain anonymous -- told NBCPhiladelphia that he and several other members of his team were let go because of the incident. The club's former security supervisor also confirmed the bloodletting with gossip blog TMZ. "We were initially all suspended and then fired for misconduct," Couri Glenn told the web site. No word on if the charges will be dropped against the patrons. Requests for comment from the club's publicist were not returned.